Ok - so I didn't learn my lesson after buying a Gold Wing. This company director's toy appeared in Devimead's showroom for £3500. I decided to buy it. I was looking for a Guzzi California but they had just released the Mk2 version which I didn't like at all - my other choice was a Honda Pan European but someone told me about the Aspencade over at Devimead's. I can remember when Devimead was the number one name in after market tuning for BSA unit twins - how times change - they ain't around any longer. This was the bike that prompted me to get a trailer, so at least that's one thing I'll be forever grateful for. That trailer has been colour matched to just about every vehicle that has ever towed it. 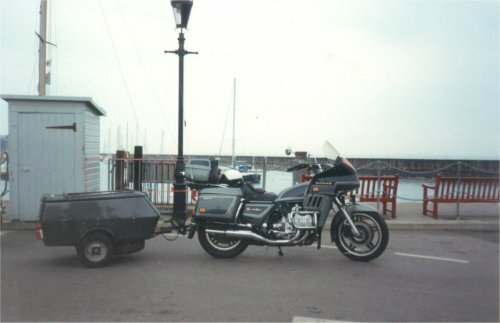 For long distance touring you can't really beat a Gold Wing, but I wasn't doing long distance continental work. 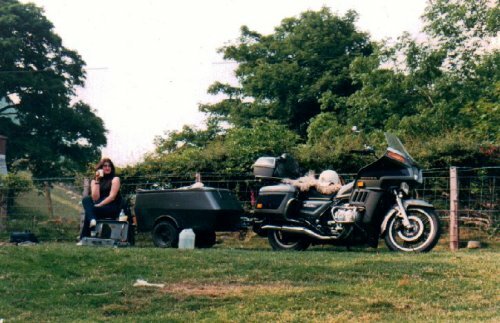 Come the Summer and that fairing was just too efficient - I'd have been more comfortable in a car with the window wound down. That was the only bike I have ever ridden whilst wearing shorts - the though of coming off was less daunting than the thought of roasting behind that fairing. After just 9000 miles I decided the Aspencade wasn't the bike for me. Once again I sold it for the same price I had given for it. I'm glad I owned it, but I can't see me having another 'Wing just yet.